This film is available for public presentations. The ancestral waters of the North Platte River have flowed for thousands of years and the river has changed its course many times. It has endured vast migrations and changing weather patterns. Over a century ago man began building great dams to store the water and still the river flowed on. Now conditions on the river are changing again and a new kind of migration is underway. This is the story of the North Platte River and it all begins upstream. 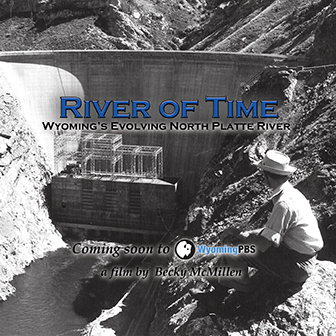 Written and directed by Becky McMillen, River of Time is the third in a series of educational films about endangered western waterways. Her first short documentary, The Hope of Nine Mile Creek screened at film festivals across the country, winning best film awards in Colorado and Iowa. The second film in the series, A River Tamed, features the history, restoration and the legal battle between states over Nebraska's Republican River. It recently screened at the Wildlife Conservation Film Festival in Denver, CO.
River of Time was featured at the 2012 Wyoming State fair. It was broadcast on Wyoming PBS on December 27, 2012 at 7pm. This film is available for public presentation and classroom use. Please contact Becky McMillen for more details.